Here is my review of Geo 3-Tone / Tri Color Green circle lenses, sponsored by Shoppingholics. I have meant to try this series of lenses for a while, as they are quite frequently seen on models in Taiwanese makeup magazines. I think the design is just as pretty in person as in the mags! The 3-Tone are "natural" lenses, with a delicate design and minimal enlargement. 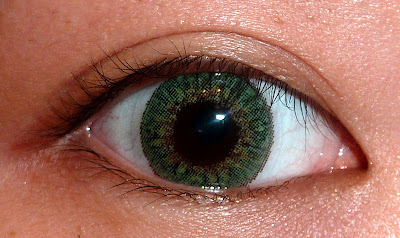 They have a grey outer ring, green main color ring and a golden-brown inner ring, to give a design that looks more realistic. 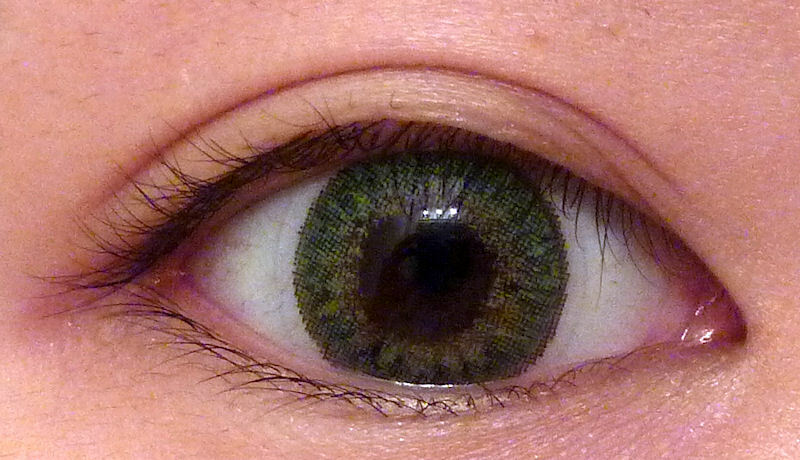 Just a note, I think I wore the lens backwards on my right eye (your left), so they look a bit mismatched. Since the lenses are designed to look natural, there is minimal enlargement. I compared the 3-tone to the similarly-patterned EOS Misty Green, as they both have a dark outer ring and golden-brown inner ring. Obviously the 3-tones are much more "real" looking, but the Misty have better enlargement and definition with the darker and thicker outer ring. I also compared to another "natural" color lens I have, Neo Cosmos Glamor Blue. 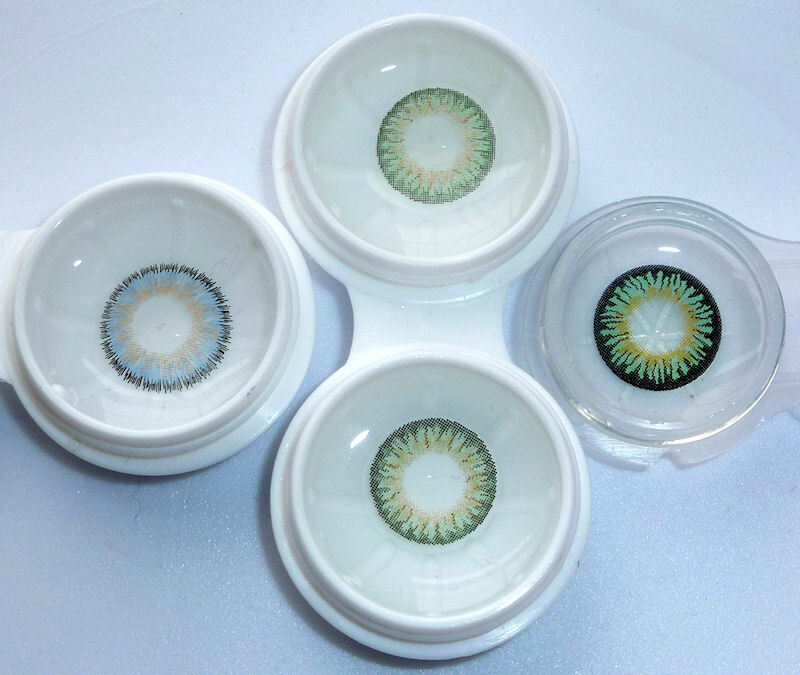 The Glamor are much brighter, but they both look quite "real" compared to other colored circle lenses. Here are all the lenses used in this review. Clockwise from the top: 3-tone green upside down, Misty green, 3-tone green right side up, Glamor blue. 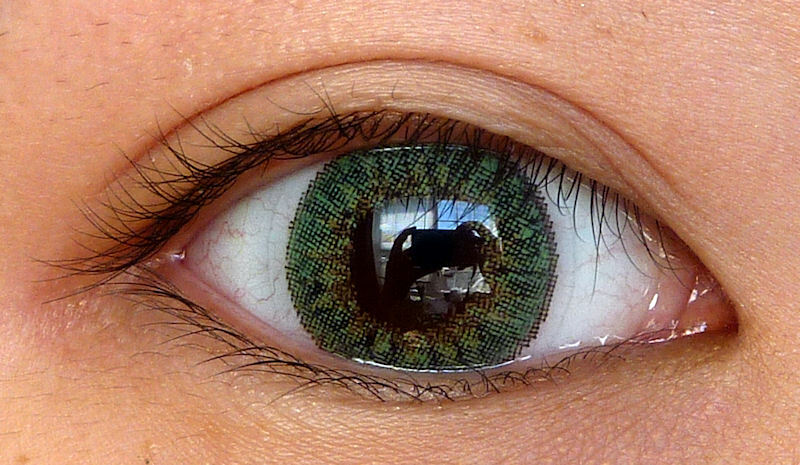 Design: 9/10 - Love the design mimicking real iris of green eyes. Enlargement: 6/10 - I don't think there is much enlargement, as these are 14.2mm lenses I think. Comfort: 8/10 - I can wear them inside out without discomfort, which is interesting. Thank you Shoppingholics for the lenses! Would you say they're a mossy green? Btw, your blog is EXTREMELY helpful with all the pictures and the detail reviews/descriptions.